The current account deficit of the United States is more than six percent of its gross domestic product-an all-time high. And the rest of the world, including other G7 countries such as Japan and Germany, must collectively run current account surpluses to finance this deficit. How long can such unevenness between imports and exports be sustained, and what form might their eventual reconciliation t… ake? Putting forth scenarios ranging from a gradual correction to a crash landing for the dollar, G7 Current Account Imbalances brings together economists from around the globe to consider the origins, status, and future of those disparities.An esteemed group of collaborators here examines the role of the bursting of the dot-com bubble, the history of previous episodes of current account adjustments, and the possibility of the Euro surpassing the dollar as the leading international reserve currency. 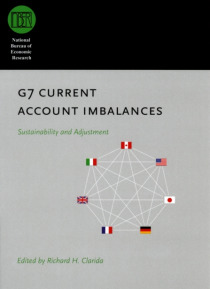 Though there are areas of broad agreement-that the imbalances will ultimately decline and that currency revaluations will be part of the solution-many areas of contention remain regarding both the dangers of imbalances and the possible forms of adjustment.�This volume will be of tremendous value to economists, politicians, and business leaders alike as they look to the future of the G7 economies.